^ 2.0 2.1 Alberts, Bruce; Alexander Johnson; Julian Lewis; Martin Raff; Keith Roberts; Peter Walters. Molecular Biology of the Cell; Fourth Edition. New York and London: Garland Science. 2002. ISBN 978-0-8153-3218-3. ^ Butler, John M. (2001) Forensic DNA Typing "Elsevier". pp. 14 – 15. ISBN 978-0-12-147951-0. ^ Mandelkern M, Elias J, Eden D, Crothers D. The dimensions of DNA in solution. J Mol Biol. 1981, 152 (1): 153 – 61. PMID 7338906. ^ Gregory S; 等. The DNA sequence and biological annotation of human chromosome 1. Nature. 2006, 441 (7091): 315 – 21. PMID 16710414. ^ 6.0 6.1 Watson J, Crick F. Molecular structure of nucleic acids; a structure for deoxyribose nucleic acid (PDF). Nature. 1953, 171 (4356): 737 – 8. PMID 13054692. 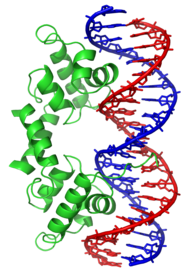 ^ 9.0 9.1 Ghosh A, Bansal M. A glossary of DNA structures from A to Z. Acta Crystallogr D Biol Crystallogr. 2003, 59 (Pt 4): 620 – 6. PMID 12657780. ^ 10.0 10.1 薛金星. 中学教材全解 工具版 高中生物必修1 分子与细胞. 陕西人民教育出版社. ISBN 9787545015751. ^ 11.0 11.1 11.2 11.3 11.4 人民教育出版社. 生物1 必修 分子与细胞. ISBN 9787107176708. ^ Takahashi I, Marmur J. Replacement of thymidylic acid by deoxyuridylic acid in the deoxyribonucleic acid of a transducing phage for Bacillus subtilis. Nature. 1963, 197: 794 – 5. PMID 13980287. ^ Agris P. Decoding the genome: a modified view. Nucleic Acids Res. 2004, 32 (1): 223 – 38. PMID 14715921. ^ Wing R, Drew H, Takano T, Broka C, Tanaka S, Itakura K, Dickerson R. Crystal structure analysis of a complete turn of B-DNA. Nature. 1980, 287 (5784): 755 – 8. PMID 7432492. ^ Pabo C, Sauer R. Protein-DNA recognition. Annu Rev Biochem: 293 – 321. PMID 6236744. ^ Ponnuswamy P, Gromiha M. On the conformational stability of oligonucleotide duplexes and tRNA molecules. J Theor Biol. 1994, 169 (4): 419 – 32. PMID 7526075. ^ Clausen-Schaumann H, Rief M, Tolksdorf C, Gaub H. Mechanical stability of single DNA molecules. Biophys J. 2000, 78 (4): 1997 – 2007. PMID 10733978. ^ Chalikian T, Völker J, Plum G, Breslauer K. A more unified picture for the thermodynamics of nucleic acid duplex melting: a characterization by calorimetric and volumetric techniques. Proc Natl Acad Sci U S A. 1999, 96 (14): 7853 – 8. PMID 10393911. ^ deHaseth P, Helmann J. Open complex formation by Escherichia coli RNA polymerase: the mechanism of polymerase-induced strand separation of double helical DNA. Mol Microbiol. 1995, 16 (5): 817 – 24. PMID 7476180. ^ Isaksson J, Acharya S, Barman J, Cheruku P, Chattopadhyaya J. Single-stranded adenine-rich DNA and RNA retain structural characteristics of their respective double-stranded conformations and show directional differences in stacking pattern. Biochemistry. 2004, 43 (51): 15996 – 6010. PMID 15609994. ^ Hüttenhofer A, Schattner P, Polacek N. Non-coding RNAs: hope or hype?. Trends Genet. 2005, 21 (5): 289 – 97. PMID 15851066. ^ Munroe S. Diversity of antisense regulation in eukaryotes: multiple mechanisms, emerging patterns. J Cell Biochem. 2004, 93 (4): 664 – 71. PMID 15389973. ^ Makalowska I, Lin C, Makalowski W. Overlapping genes in vertebrate genomes. Comput Biol Chem. 2005, 29 (1): 1 – 12. PMID 15680581. ^ Johnson Z, Chisholm S. Properties of overlapping genes are conserved across microbial genomes. Genome Res. 2004, 14 (11): 2268 – 72. PMID 15520290. ^ Lamb R, Horvath C. Diversity of coding strategies in influenza viruses. Trends Genet. 1991, 7 (8): 261 – 6. PMID 1771674. ^ Davies J, Stanley J. Geminivirus genes and vectors. Trends Genet. 1989, 5 (3): 77 – 81. PMID 2660364. ^ Berns K. Parvovirus replication. Microbiol Rev. 1990, 54 (3): 316 – 29. PMID 2215424. ^ Benham C, Mielke S. DNA mechanics. Annu Rev Biomed Eng: 21 – 53. PMID 16004565. ^ 31.0 31.1 Champoux J. DNA topoisomerases: structure, function, and mechanism. Annu Rev Biochem: 369 – 413. PMID 11395412. ^ 32.0 32.1 Wang J. Cellular roles of DNA topoisomerases: a molecular perspective. Nat Rev Mol Cell Biol. 2002, 3 (6): 430 – 40. PMID 12042765. ^ 33.0 33.1 Hayashi G, Hagihara M, Nakatani K. Application of L-DNA as a molecular tag. Nucleic Acids Symp Ser (Oxf). 2005, 49: 261 – 262. PMID 17150733. ^ Vargason JM, Eichman BF, Ho PS. The extended and eccentric E-DNA structure induced by cytosine methylation or bromination. Nature Structural Biology. 2000, 7: 758 – 761. PMID 10966645. ^ Wang G, Vasquez KM. Non-B DNA structure-induced genetic instability. Mutat Res. 2006, 598 (1 – 2): 103 – 119. PMID 16516932. ^ Allemand; 等. 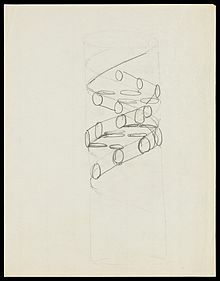 Stretched and overwound DNA forms a Pauling-like structure with exposed bases. PNAS. 1998, 24: 14152–14157. PMID 9826669. ^ Palecek E. Local supercoil-stabilized DNA structures. Critical Reviews in Biochemistry and Molecular Biology. 1991, 26 (2): 151 – 226. PMID 1914495. ^ Basu H, Feuerstein B, Zarling D, Shafer R, Marton L. Recognition of Z-RNA and Z-DNA determinants by polyamines in solution: experimental and theoretical studies. J Biomol Struct Dyn. 1988, 6 (2): 299 – 309. PMID 2482766. ^ Leslie AG, Arnott S, Chandrasekaran R, Ratliff RL. Polymorphism of DNA double helices. J. Mol. Biol. 1980, 143 (1): 49–72. PMID 7441761. ^ Wahl M, Sundaralingam M. Crystal structures of A-DNA duplexes. Biopolymers. 1997, 44 (1): 45 – 63. PMID 9097733. ^ Lu XJ, Shakked Z, Olson WK. A-form conformational motifs in ligand-bound DNA structures. J. Mol. Biol. 2000, 300 (4): 819–40. PMID 10891271. ^ Rothenburg S, Koch-Nolte F, Haag F. DNA methylation and Z-DNA formation as mediators of quantitative differences in the expression of alleles. Immunol Rev: 286 – 98. PMID 12086319. 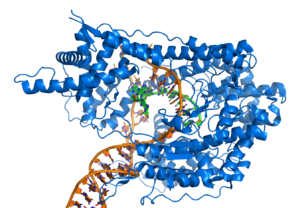 ^ Oh D, Kim Y, Rich A. Z-DNA-binding proteins can act as potent effectors of gene expression in vivo. Proc. Natl. Acad. Sci. U.S.A. 2002, 99 (26): 16666–71. PMID 12486233. ^ 45.0 45.1 Greider C, Blackburn E. Identification of a specific telomere terminal transferase activity in Tetrahymena extracts. Cell. 1985, 43 (2 Pt 1): 405 – 13. PMID 3907856. ^ 46.0 46.1 46.2 Nugent C, Lundblad V. The telomerase reverse transcriptase: components and regulation. Genes Dev. 1998, 12 (8): 1073 – 85. PMID 9553037. ^ Wright W, Tesmer V, Huffman K, Levene S, Shay J. Normal human chromosomes have long G-rich telomeric overhangs at one end. Genes Dev. 1997, 11 (21): 2801 – 9. PMID 9353250. ^ 48.0 48.1 Burge S, Parkinson G, Hazel P, Todd A, Neidle S. Quadruplex DNA: sequence, topology and structure. Nucleic Acids Res. 2006, 34 (19): 5402 – 15. PMID 17012276. ^ Parkinson G, Lee M, Neidle S. Crystal structure of parallel quadruplexes from human telomeric DNA. Nature. 2002, 417 (6891): 876 – 80. PMID 12050675. ^ Griffith J, Comeau L, Rosenfield S, Stansel R, Bianchi A, Moss H, de Lange T. Mammalian telomeres end in a large duplex loop. Cell. 1999, 97 (4): 503 – 14. PMID 10338214. ^ Klose R, Bird A. Genomic DNA methylation: the mark and its mediators. Trends Biochem Sci. 2006, 31 (2): 89–97. PMID 16403636. ^ Bird A. DNA methylation patterns and epigenetic memory. Genes Dev. 2002, 16 (1): 6–21. PMID 11782440. ^ Walsh C, Xu G. Cytosine methylation and DNA repair. Curr Top Microbiol Immunol: 283–315. PMID 16570853. ^ Ratel D, Ravanat J, Berger F, Wion D. N6-methyladenine: the other methylated base of DNA. Bioessays. 2006, 28 (3): 309–15. PMID 16479578. ^ Gommers-Ampt J, Van Leeuwen F, de Beer A, Vliegenthart J, Dizdaroglu M, Kowalak J, Crain P, Borst P. beta-D-glucosyl-hydroxymethyluracil: a novel modified base present in the DNA of the parasitic protozoan T. brucei. Cell. 1993, 75 (6): 1129–36. PMID 8261512. ^ Douki T, Reynaud-Angelin A, Cadet J, Sage E. Bipyrimidine photoproducts rather than oxidative lesions are the main type of DNA damage involved in the genotoxic effect of solar UVA radiation. Biochemistry. 2003, 42 (30): 9221–6. PMID 12885257. ^ Cadet J, Delatour T, Douki T, Gasparutto D, Pouget J, Ravanat J, Sauvaigo S. Hydroxyl radicals and DNA base damage. Mutat Res. 1999, 424 (1–2): 9–21. PMID 10064846. ^ Shigenaga M, Gimeno C, Ames B. Urinary 8-hydroxy-2′-deoxyguanosine as a biological marker of in vivo oxidative DNA damage (PDF). Proc Natl Acad Sci U S A. 1989, 86 (24): 9697–701. PMID 2602371. ^ Cathcart R, Schwiers E, Saul R, Ames B. Thymine glycol and thymidine glycol in human and rat urine: a possible assay for oxidative DNA damage (PDF). Proc Natl Acad Sci U S A. 1984, 81 (18): 5633–7. PMID 6592579. ^ Valerie K, Povirk L. Regulation and mechanisms of mammalian double-strand break repair. Oncogene. 2003, 22 (37): 5792–812. PMID 12947387. ^ Ferguson L, Denny W. The genetic toxicology of acridines. Mutat Res. 1991, 258 (2): 123–60. PMID 1881402. 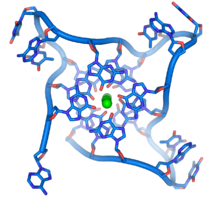 ^ Jeffrey A. DNA modification by chemical carcinogens. Pharmacol Ther. 1985, 28 (2): 237–72. PMID 3936066. ^ Stephens T, Bunde C, Fillmore B. Mechanism of action in thalidomide teratogenesis. Biochem Pharmacol. 2000, 59 (12): 1489–99. PMID 10799645. ^ Braña M, Cacho M, Gradillas A, de Pascual-Teresa B, Ramos A. Intercalators as anticancer drugs. Curr Pharm Des. 2001, 7 (17): 1745–80. PMID 11562309. ^ Venter J; 等. The sequence of the human genome. Science. 2001, 291 (5507): 1304–51. PMID 11181995. ^ Thanbichler M, Wang S, Shapiro L. The bacterial nucleoid: a highly organized and dynamic structure. J Cell Biochem. 2005, 96 (3): 506–21. PMID 15988757. ^ Wolfsberg T, McEntyre J, Schuler G. Guide to the draft human genome. Nature. 2001, 409 (6822): 824–6. PMID 11236998. ^ Gregory T. The C-value enigma in plants and animals: a review of parallels and an appeal for partnership. Ann Bot (Lond). 2005, 95 (1): 133–46. PMID 15596463. ^ The ENCODE Project Consortium. Identification and analysis of functional elements in 1% of the human genome by the ENCODE pilot project. Nature. 2007, 447 (7146): 799–816. doi:10.1038/nature05874. ^ Harrison P, Hegyi H, Balasubramanian S, Luscombe N, Bertone P, Echols N, Johnson T, 马克·本德·歌诗坦（英语：Mark Bender Gerstein）. Molecular fossils in the human genome: identification and analysis of the pseudogenes in chromosomes 21 and 22. Genome Res. 2002, 12 (2): 272–80. PMID 11827946. ^ Harrison P, 马克·本德·歌诗坦（英语：Mark Bender Gerstein）. Studying genomes through the aeons: protein families, pseudogenes and proteome evolution. J Mol Biol. 2002, 318 (5): 1155–74. PMID 12083509. ^ Albà M. Replicative DNA polymerases. Genome Biol. 2001, 2 (1): REVIEWS3002. PMID 11178285. ^ Sandman K, Pereira S, Reeve J. Diversity of prokaryotic chromosomal proteins and the origin of the nucleosome. Cell Mol Life Sci. 1998, 54 (12): 1350–64. PMID 9893710. ^ Dame RT. The role of nucleoid-associated proteins in the organization and compaction of bacterial chromatin. Mol. Microbiol. 2005, 56 (4): 858–70. PMID 15853876. ^ Luger K, Mäder A, Richmond R, Sargent D, Richmond T. Crystal structure of the nucleosome core particle at 2.8 A resolution. Nature. 1997, 389 (6648): 251–60. PMID 9305837. ^ Jenuwein T, Allis C. Translating the histone code. Science. 2001, 293 (5532): 1074–80. PMID 11498575. ^ Ito T. Nucleosome assembly and remodelling. Curr Top Microbiol Immunol: 1–22. PMID 12596902. ^ Thomas J. HMG1 and 2: architectural DNA-binding proteins. Biochem Soc Trans. 2001, 29 (Pt 4): 395–401. PMID 11497996. ^ Grosschedl R, Giese K, Pagel J. HMG domain proteins: architectural elements in the assembly of nucleoprotein structures. Trends Genet. 1994, 10 (3): 94–100. PMID 8178371. ^ Iftode C, Daniely Y, Borowiec J. Replication protein A (RPA): the eukaryotic SSB. Crit Rev Biochem Mol Biol. 1999, 34 (3): 141–80. PMID 10473346. ^ Myers L, Kornberg R. Mediator of transcriptional regulation. Annu Rev Biochem: 729–49. PMID 10966474. ^ Spiegelman B, Heinrich R. Biological control through regulated transcriptional coactivators. Cell. 2004, 119 (2): 157–67. PMID 15479634. ^ Li Z, Van Calcar S, Qu C, Cavenee W, Zhang M, Ren B. A global transcriptional regulatory role for c-Myc in Burkitt's lymphoma cells. Proc Natl Acad Sci U S A. 2003, 100 (14): 8164–9. PMID 12808131. ^ Pabo C, Sauer R. Protein-DNA recognition. Annu Rev Biochem: 293–321. PMID 6236744. ^ Bickle T, Krüger D. Biology of DNA restriction. Microbiol Rev. 1993, 57 (2): 434–50. PMID 8336674. ^ 91.0 91.1 Doherty A, Suh S. Structural and mechanistic conservation in DNA ligases.. Nucleic Acids Res. 2000, 28 (21): 4051–8. PMID 11058099. ^ Schoeffler A, Berger J. Recent advances in understanding structure-function relationships in the type II topoisomerase mechanism. Biochem Soc Trans. 2005, 33 (Pt 6): 1465–70. PMID 16246147. ^ Joyce C, Steitz T. Polymerase structures and function: variations on a theme?. J Bacteriol. 1995, 177 (22): 6321–9. PMID 7592405. ^ Hubscher U, Maga G, Spadari S. Eukaryotic DNA polymerases. Annu Rev Biochem: 133–63. PMID 12045093. ^ Johnson A, O'Donnell M. Cellular DNA replicases: components and dynamics at the replication fork. Annu Rev Biochem: 283–315. PMID 15952889. ^ Tarrago-Litvak L, Andréola M, Nevinsky G, Sarih-Cottin L, Litvak S. The reverse transcriptase of HIV-1: from enzymology to therapeutic intervention. FASEB J. 1994, 8 (8): 497–503. PMID 7514143. ^ Martinez E. Multi-protein complexes in eukaryotic gene transcription. Plant Mol Biol. 2002, 50 (6): 925–47. PMID 12516863. ^ Cremer T, Cremer C. Chromosome territories, nuclear architecture and gene regulation in mammalian cells. Nat Rev Genet. 2001, 2 (4): 292–301. PMID 11283701. ^ Pál C, Papp B, Lercher M. An integrated view of protein evolution. Nat Rev Genet. 2006, 7 (5): 337–48. PMID 16619049. ^ O'Driscoll M, Jeggo P. The role of double-strand break repair - insights from human genetics. Nat Rev Genet. 2006, 7 (1): 45–54. PMID 16369571. ^ Vispé S, Defais M. Mammalian Rad51 protein: a RecA homologue with pleiotropic functions. Biochimie. 1997, 79 (9-10): 587–92. PMID 9466696. ^ Neale MJ, Keeney S. Clarifying the mechanics of DNA strand exchange in meiotic recombination. Nature. 2006, 442 (7099): 153–8. PMID 16838012. ^ Dickman M, Ingleston S, Sedelnikova S, Rafferty J, Lloyd R, Grasby J, Hornby D. The RuvABC resolvasome. 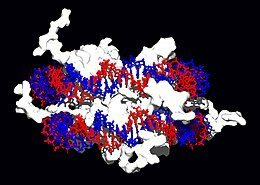 Eur J Biochem. 2002, 269 (22): 5492–501. PMID 12423347. ^ Joyce G. The antiquity of RNA-based evolution. Nature. 2002, 418 (6894): 214–21. PMID 12110897. ^ Orgel L. Prebiotic chemistry and the origin of the RNA world (PDF). Crit Rev Biochem Mol Biol: 99–123. PMID 15217990. （原始内容 (PDF)存档于2007-07-10）. ^ Davenport R. Ribozymes. Making copies in the RNA world. Science. 2001, 292 (5520): 1278. PMID 11360970. ^ Szathmáry E. What is the optimum size for the genetic alphabet? (PDF). Proc Natl Acad Sci U S A. 1992, 89 (7): 2614–8. PMID 1372984. ^ Lindahl T. Instability and decay of the primary structure of DNA. Nature. 1993, 362 (6422): 709–15. PMID 8469282. ^ Vreeland R, Rosenzweig W, Powers D. Isolation of a 250 million-year-old halotolerant bacterium from a primary salt crystal. Nature. 2000, 407 (6806): 897–900. PMID 11057666. ^ Hebsgaard M, Phillips M, Willerslev E. Geologically ancient DNA: fact or artefact?. Trends Microbiol. 2005, 13 (5): 212–20. PMID 15866038. ^ Nickle D, Learn G, Rain M, Mullins J, Mittler J. Curiously modern DNA for a "250 million-year-old" bacterium. J Mol Evol. 2002, 54 (1): 134–7. PMID 11734907. ^ Goff SP, Berg P. Construction of hybrid viruses containing SV40 and lambda phage DNA segments and their propagation in cultured monkey cells. Cell. 1976, 9 (4 PT 2): 695–705. PMID 189942. ^ Houdebine L. Transgenic animal models in biomedical research. Methods Mol Biol: 163–202. PMID 17172731. ^ Daniell H, Dhingra A. Multigene engineering: dawn of an exciting new era in biotechnology. Curr Opin Biotechnol. 2002, 13 (2): 136–41. PMID 11950565. ^ Job D. Plant biotechnology in agriculture. Biochimie. 2002, 84 (11): 1105–10. PMID 12595138. ^ Collins A, Morton N. Likelihood ratios for DNA identification (PDF). Proc Natl Acad Sci U S A. 1994, 91 (13): 6007–11. PMID 8016106. ^ Weir B, Triggs C, Starling L, Stowell L, Walsh K, Buckleton J. Interpreting DNA mixtures. J Forensic Sci. 1997, 42 (2): 213–22. PMID 9068179. ^ Jeffreys A, Wilson V, Thein S. Individual-specific 'fingerprints' of human DNA.. Nature: 76–9. PMID 2989708. ^ DNA Identification in Mass Fatality Incidents. National Institute of Justice. September 2006. （原始内容存档于2006-11-12）. ^ Legal Frontline 法律前線通訊社. MAY 4 少年無照駕駛佯稱父親肇事 --- 血跡DNA揭謊言保險公司拒賠. ^ Wray G. Dating branches on the tree of life using DNA. Genome Biol. 2002, 3 (1): REVIEWS0001. PMID 11806830. ^ Kleiman, Yaakov. "The Cohanim/DNA Connection: The fascinating story of how DNA studies confirm an ancient biblical tradition". aish.com (January 13, 2000). Accessed 4 March 2006. ^ Gusfield, Dan. Algorithms on Strings, Trees, and Sequences: Computer Science and Computational Biology. Cambridge University Press, 15 January 1997. ISBN 978-0-521-58519-4. ^ Sjölander K. Phylogenomic inference of protein molecular function: advances and challenges. Bioinformatics. 2004, 20 (2): 170–9. PMID 14734307. ^ Mount DM. Bioinformatics: Sequence and Genome Analysis 2. Cold Spring Harbor, NY: Cold Spring Harbor Laboratory Press. 2004. ISBN 0879697121. ^ Adleman L. Molecular computation of solutions to combinatorial problems. Science. 1994, 266 (5187): 1021–4. PMID 7973651. 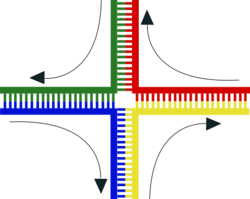 ^ Benenson Y, Paz-Elizur T, Adar R, Keinan E, Livneh Z, Shapiro E. Programmable and autonomous computingmachine made of biomolecules. Nature. 2001, 414: 430–434. 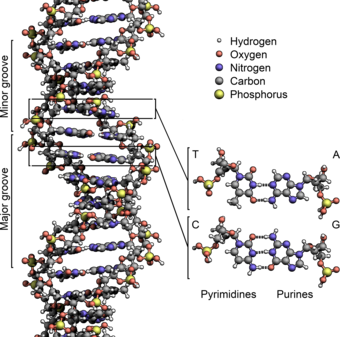 ^ Parker J. Computing with DNA.. EMBO Rep. 2003, 4 (1): 7–10. PMID 12524509. ^ Ashish Gehani, Thomas LaBean and John Reif. DNA-Based Cryptography. Proceedings of the 5th DIMACS Workshop on DNA Based Computers, Cambridge, MA, USA, 14–15 June 1999. ^ Coffer, J. L.; 等. Dictation of the shape of mesoscale semiconductor nanoparticle assemblies by plasmid DNA. Appl. Phys. Lett. 1996, 69: 3851–3853. ^ Strong M. Protein Nanomachines. PLoS Biology. 2004, 2: e73. ^ Chen J, Seeman NC. Synthesis from DNA of a molecule with the connectivity of a cube. Nature. 1991, 350: 631–633. ^ Mao C, Sun W, Shen Z, Seeman NC. 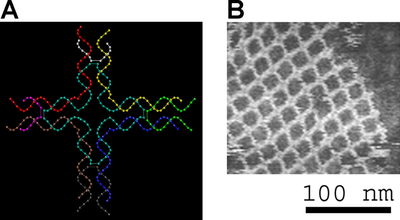 A nanomechanical device based on the B-Z transition of DNA. Nature. 1999, 397: 144–146. ^ Bernard Yurke, Andrew J. Turberfield, Allen P. Mills, Jr, Friedrich C. Simmel and Jennifer L. Neumann. A DNA-Fuelled Molecular Machine Made of DNA. Nature. 2000, 406: 605–608. ^ Dahm R. Friedrich Miescher and the discovery of DNA. Dev Biol. 2005, 278 (2): 274–88. PMID 15680349. ^ Levene P,. The structure of yeast nucleic acid. J Biol Chem. 1919, 40 (2): 415–24. ^ Astbury W,. Nucleic acid. Symp. SOC. Exp. Bbl. 1947, 1 (66). ^ Avery O, MacLeod C, McCarty M. Studies on the chemical nature of the substance inducing transformation of pneumococcal types. Inductions of transformation by a desoxyribonucleic acid fraction isolated from pneumococcus type III. J Exp Med. 1944, 79 (2): 137–158. ^ Hershey A, Chase M. Independent functions of viral protein and nucleic acid in growth of bacteriophage (PDF). J Gen Physiol. 1952, 36 (1): 39–56. PMID 12981234. ^ 146.0 146.1 Watson J.D. and Crick F.H.C. "A Structure for Deoxyribose Nucleic Acid". (PDF) Nature 171, 737–738 (1953). Accessed 13 Feb 2007. ^ Crystallographic photo of Sodium Thymonucleate, Type B. "Photo 51." M…. 2012-05-25. （原始内容存档于2012-05-25）. ^ Meselson M, Stahl F. The replication of DNA in Escherichia coli. Proc Natl Acad Sci U S A. 1958, 44 (7): 671–82. PMID 16590258. ^ International Human Genome Sequencing Consortium. Initial sequencing and analysis of the human genome. (PDF). Nature. 2001, 409: 860−921. ^ Venter, JC; 等. The sequence of the human genome. (PDF). Science. 2001, 291: 1304−1351. （英文） Olby, Robert. The Path to The Double Helix: Discovery of DNA, first published in October 1974 by MacMillan, with foreword by Francis Crick; ISBN 978-0-486-68117-7; the definitive DNA textbook, revised in 1994, with a 9 page postscript. （英文） Rose, Steven. The Chemistry of Life, Penguin, ISBN 978-0-14-027273-4. （英文） Watson, James D. and Francis H.C. Crick. A structure for Deoxyribose Nucleic Acid (PDF). Nature 171, 737–738, 25 April 1953. （英文） Watson, James D. DNA: The Secret of Life ISBN 978-0-375-41546-3. （英文） Olby, R. (2003) "Quiet debut for the double helix" Nature 421 (January 23): 402–405.